One of my worst fears when getting my first tattoo was that I would regret something. I didn’t know whether that would be regretting the placement, the timing, or the tattoo itself. Many of my friends got their tattoos immediately after their eighteenth birthdays. Naturally, for the sake of fitting in, I was compelled to complete this sacrament. But as someone that considers themselves a logical and purposeful thinker, I decided that getting a tattoo on a whim was not part of my nature. Shop INKED by dani Temporary Tattoo Set here! I started my planning early- almost a year before I made the appointment to actually get the tattoo. I set goals: make a design plan, find a price range, and locate a reputable studio. Since this was my first tattoo, I set the price range higher than most people ever would consider paying for a tattoo. Eventually, I ended up choosing BANG BANG tattoo studio in New York City. BANG houses some of the top tattoo artists in the world and regularly completes tattoos for A-List clients like Justin Bieber, Rita Ora, the Beckhams, and Rihanna. Both my mom and I admired Keith McCurdy (aka BANG BANG) and his artistic styles, so naturally he was both of our first picks. Keith himself was very far out of my price range (starting price for an appointment was upwards of $5000- not including hourly), so I opted for one of his other artists. While many of the studios back home were relatively inexpensive, I didn't like any of their works (nor trusted them to put a needle to my body). If I was paying enough, I would deserve to feel safe and secure. At BANG, you submit a request for a tattoo appointment and the management chooses which artists would be best for you based on what you want the tattoo to be. They refuse to tattoo in a place or use a design that you may regret. With that, I chose an artist at the studio who focuses on black/white realism tattoos rather than the traditional color tattoos. In other words, you get what you pay for. After filing the logistics and making my appointment, I was very excited. I had chosen to get a tattoo of a pinecone, something that I had loved since I was very little. It was my nickname growing up and reminded me of my father and our times in the woods together. Naturally, since this was so important to me, I wanted it to be in a place that I could see it and with an artist that could do it justice. But, I was dealing with the contention of wanting a visible tattoo and one that I could easily hide. Several of my friends had tattoos on their forearms and on their shoulders, places that could be seen as unprofessional by potential employers. As someone going for a law degree, I thought it would be in my best interest to get a tattoo that wasn’t obscene nor dangerous to my reputation. After deliberating with my tattoo artist, Turan, and my internal reservations, I decided on getting a tattoo on my inner bicep. If I lay my arm flat, the tattoo isn’t visible. However, another challenge soon popped up in choosing this location: my poor pain tolerance. The inner bicep, foot, wrist, and spine are some of the most sensitive parts of your body to get a tattoo. Needles and I haven’t agreed in the past and have encounters usually resulted in trips to the emergency room or ‘WARNING: PASSES OUT’ notes on my medical forms. Per the studio’s recommendations, I hydrated and ate regularly in the days prior to my appointment. Not only does it keep the skin healthy for the ink, but it regulates your blood sugar levels so you don’t pass out. I got a full eight hours of sleep prior to my 6pm appointment, but even sleep couldn’t dull my excitement (and nerves) for this important day. When I walked into the studio, I was amazed by the cleanliness and the precision of the artists. Everything was sanitized after each client and the staff used fresh needles and ink for every tattoo. The staff was honest, friendly, and conscious of my concerns. If I had chosen a studio in my hometown, it was almost guaranteed that I would have walked away with a bad tattoo and an infection to match. What saved me from making this mistake? Doing my research. I looked up several red-flags in tattoo shops before I first stepped foot into one. I visited the studio prior to my appointment to see the layout, check for sanitation, and learn about their aftercare procedures. If I was planning to drop $1,000 on a tattoo, I wanted to make sure it was going to be absolutely perfect. After a custom drawing session and stencil-laying period, I was ready to go under the needle. Turan talked to me the whole time, making sure that I was breathing and relaxed. And honestly, it didn’t hurt. I would describe the feeling of the needles (a series of needles are used for shading and actually hurt less than a singular needle) as if someone was picking up my skin with tweezers and placing it down. It was more annoying than it was painful. After an intense lecture about the importance of aftercare, I was on my way back to Connecticut. In the end, I didn’t have many reservations about my experience at BANG. Needless to say, my wallet was almost $700 lighter than when I left my house, but my heart was full. If I was planning to drop $1,000 on a tattoo, I wanted to make sure it was going to be absolutely perfect. So why don’t employers appreciate tattoos for the art that they are? Well, tattoos earn a bad rap. They can contain expletives and inappropriate designs that employers don’t want to use to represent their company. If you get a meaningful tattoo that is done in a clandestine place, odds are that you won’t regret it. In short, be thoughtful and meaningful about your decision to get a tattoo. I often relate the beauty seen in tattoos to the artistic talent that is seen in graffiti. For decades, both graffiti and tattoos were seen as eyesores and regarded as the product of youth delinquency. Now, businesses can pay people to spray paint designs on their outside of their building. Contemporary tattoo artists are now seen as that: artists. But many employers are still hesitant to hire people with tattoos, so it’s always valuable to air on the side of caution. After all, you don’t get to make the rules when it comes to what a company expects from their employees. In the end, art is valued by the beholder. And for me, tattoos are like a form of wearable art that you get to keep for forever. If I didn’t have peace-of-mind prior to my appointment, I guarantee that I wouldn’t be as satisfied with my tattoo as I am now, nor would I be able to appreciate the countless hours that went into it. 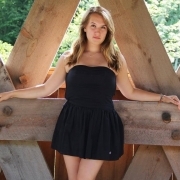 Sara is a managing editor at bSmart Guide and student at the University of Vermont. She plans to attend environmental law school following graduation.